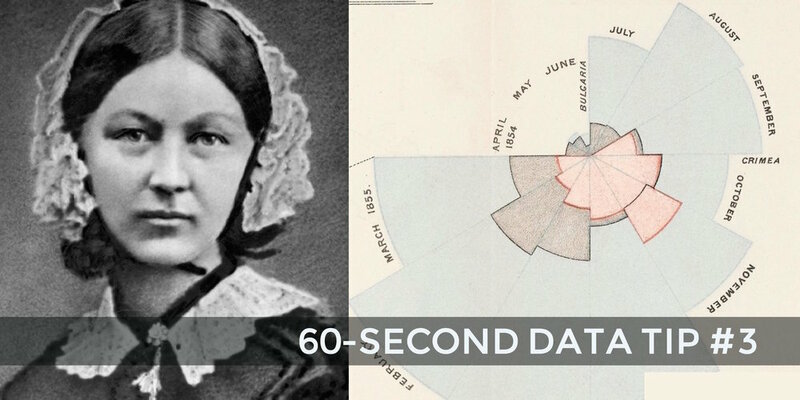 Like many nonprofit staff today, Florence Nightingale probably wasn’t a numbers person at the outset. She became a nurse to serve others. Yet, she soon realized she could provide care more effectively with the help of data. Working with a statistician named William Farr, Nightingale analyzed mortality rates during the Crimean War. She and Farr discovered that most of the soldiers who died in the conflict perished not in combat but as a result of “preventable diseases” caused by bad hygiene. Nightingale’s solution? She invented the polar area chart, a variant of the pie chart, meant “to affect thro’ the Eyes what we fail to convey to the public through their word-proof ears.” Each pie represented a twelve-month period of the war, with each slice showing the number of deaths per month, growing outward if the number increased, and color-coded to show the causes of death (blue: preventable, red: wounds, black: other). Clearly seeing the importance of hygiene, the Queen and Parliament quickly set up a sanitary commission and, as a result, mortality rates fell. Also, see the Smithsonian's excellent article The Surprising History of the Infographic for more on the history of data visualization.